There are tons of the urban art displays scattered throughout Boston. 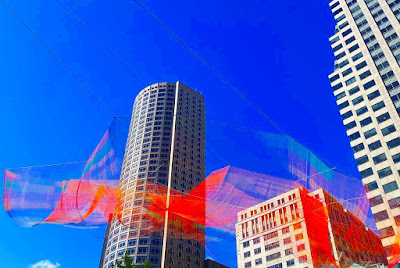 But the most recent catching our attention was the aerial sculpture seen floating amid the city's skyline. Curious, as I'm sure many fellow Bostonians can relate, we wanted to learn more about the organization who commissioned these urban art projects and how it all started. Luckily, our new-found friends at Rose Kennedy Greenway were more than happy to share their story on Travel The East! Known as a not-so-hidden gem in Boston, the Rose F. Kennedy Greenway has become one of the city’s most notable parks. What used to be streets filled with ongoing traffic, noise and angry drivers has now transformed into a spot where people want to stroll through after the Big Dig was completed in 2007. No one would have expected the land to be as green as it is today, and we are proud to have contributed to that drastic change. 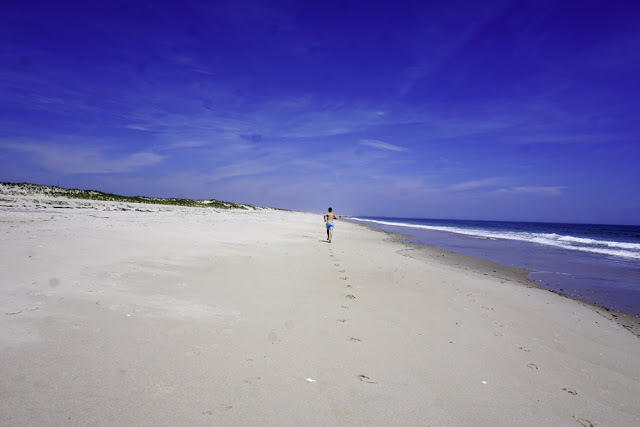 Long Island is home to some of the best beaches around the world. If you don't believe it, check out National Geographic's article ranking The Hamptons at number 4 in its list of Top 10 Beaches! The Hamptons region is a relatively large stretch of coastal land encompassing a number of towns on Long Island's South Fork including Southampton, East Hampton, Westhampton Beach, as well as towns along the outskirts like Sag Harbor and Montauk. It is known to be the playground for the rich, but that doesn't stop off-the-A-list visitors from also enjoying the gorgeous beaches and scenery the Hamptons have to offer. Growing up on Long Island, I spent many of my Summer weekends at the beach. Even with living four and half hours away now, we still make the drive to enjoy some of our warm weather weekends on Long Island's East End. What the heck is a basin? Our question exactly when we saw the signs off I-93 on our trip up to the White Mountains. With no set agenda for the day, we made a quick pit stop to check it out! The Basin is located in Franconia Notch State Park which is in northern New Hampshire. It stands as one of New Hampshire's natural wonders. Fifteen thousand years of rushing water from the melting of the North American ice sheet has eroded the rock into a cave-like formation. The Basin itself is a 20 foot-round granite pothole with waterfalls flowing into the Pemigewasset River. The trails are only about 1.5 miles long. Most areas are paved, making it fit for all skill levels. It is a quick trip with plenty of beautiful sites to see. Whether you are visiting Franconia Notch State Park or just driving through the area, The Basin is a breathtaking place worth visiting!